That is a mass that could not be ignored, if it only acted, spoke and negotiated with one voice. In practice, thanks to decades of deregulation, privatizations, restructurings, offsourcing and so on, more of those people every year are employed with part time contracts, often lasting just a few months, on all possible work shift 24⁄7, and scattered (that is isolated) among tens of small companies without any connection with each other. These are many thousands of people who are never the same from one month to the other, and can only see and talk with their direct coworkers (with traditional means, that is). The second fact is that, while the great majority of these people lives less than 10 kms away from theairport, and almost none is more than 30 kms away, almost all these people who are “guilty to still have a job” are forced to commute with their own car, suffering all the problems shown in the picture (*). Train connections with Rome is useful to a tiny minority, public buses between the airport and the closest neighborhoods are absent or completely useless anyway (remember that we are talking of people who start or stop working at literally any time of the day! ), the roads are narrow enough that anybody trying to commute by foot or bycicle would surely end up as roadkill sooner or later. Local politicians and administrators couldn’t care less, or make things even worse planning new, but useless bridges. The third fact is that, among all those “airport workers” forced to burn hundreds of Euros and tens of hours every month just to work, more and more every year are those who own a smartphone and use it regularly to be online. It is absolutely normal, anywhere in the airport, to see flight and ground personnel of all categories spending on their smartphone every minute of pause they get. Let’s now step back in time for a moment: not so long ago, most airport workers would come and go from the airport on company buses, whatever shift they were on. This was great not just for those workers, but for everybody else driving or living around the airport, because local roads weren’t congested by hundreds of useless cars. Today those buses are all but disappeared, because the companies operating in the airport see no obligations nor incentives to make life better for those people still lucky enough to be employed. Besides, thanks to outsorcing, subcontracting and so on, those companies are fragmented enough that it would take years to just create a commission able to contract a new bus service for the whole airport. dear private bus companies, we’re here, all together: we’re thousands of people to move back and forth from the same place, every hour, every day. Thanks to the Internet, we’re able to collect all our shifts by ourselves, that is to calculate and let you know every week how many buses we need, when and on which routes. We’re able, that is, to fill your buses even when they would otherwise be empty, for example when they come to the airport to load tourists. And we could do all this without intermediaries that would reduce our savings, or your gains. Which of you will give us the better deal? Of course, being Italy what it is, creating the cooperative, or equivalent structure, that should officially negotiate and manage such a contract would be more complicated than in other countries. And of course, it should pay adequately the developers that would create the software to calculate the bus routes according to the workers’ shifts, every week. Still, it would almost surely be worth it. Even if the whole airport ended up to only employ workers with 3-months contracts, changing every quarter, every one of them could subscribe and use the service on a monthly basis. There would still be enough people to move every day to make the bus companies happy. Why is it that none of the airport workers that already use smartphones and Internet every moment they can has realized that they could use those tools also to get something that, for all practical purposes, would be equivalent to a tax-exempt salary increase? 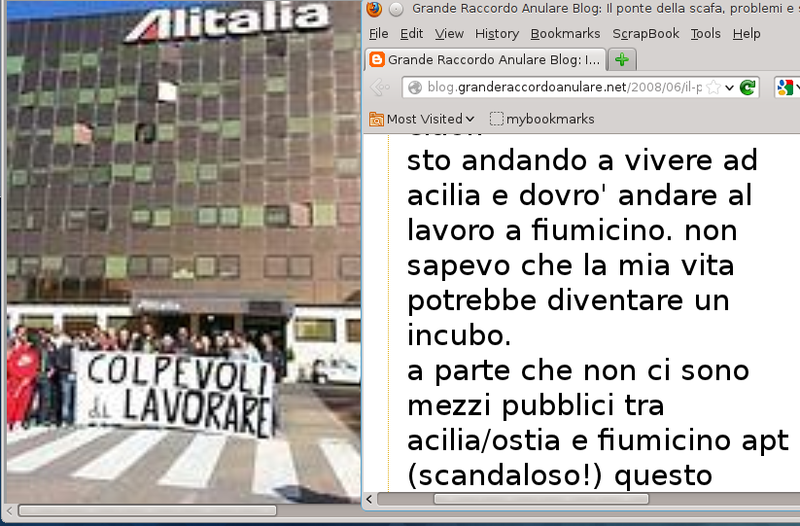 (*) the image is a collage from this article, that gives an idea of how many categories of workers may benefit from such a service, and of a comment to this blog post, that explains what a useless burden it is to commute to and from Fiumicino, for the reasons that I explained here.